I found this recipe years ago, and when I went back to visit the original source, it was gone. But fortunately, I had jotted down the ingredients and was able to find my scratchings on a napkin. See? Hoarding isn't always a bad thing! Prepare an 8x8 glass pan with cooking spray and parchment paper. Melt the chips on medium power in the microwave, stirring after each minute for a total of 3 minutes. Your mileage may vary in your microwave. Chop the peanuts coarsely and set aside. In a large bowl, whisk together the whiskey and sugar. Add the peanuts and chocolate and stir well. Pour into the prepared pan, smoothing the top with a spatula through another piece of parchment paper. Place in fridge for a few hours. Remove fudge from the pan, cut and scarf down. Hi Cyndi. 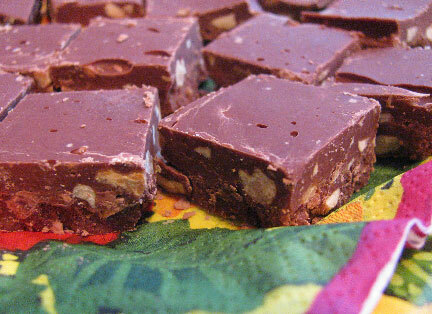 Your fudge in one word; "Yum!". I used to work as non-sworn for law enforcement so I know the challenges if public safety. Great job to the Boston and surrounding area law enforcement. And. My wide and I had a chance to go to Italy in 2011. That was time travel. The margherita pizza, the beer and the pasta were extradonaire. Ciao! Cyndi... the only thing I would suggest is that you use pecans... and a good bourbon. You'd be right here in Kentucky at Derby time with those ingredients (would remind you of our famous Derby Pie, which I have a killer recipe for if you'd ever like it)! Sound delicious and I just might try it if I can sneak some of my hubby's whiskey away from him!